A genuine test laboratory, in the space of six months the Multi70 Edmond de Rothschild has become the perfect guinea pig for Gitana Team’s design office. After an initial research phase involving T-foil rudders, which was validated by Sébastien Josse’s third place in the Route du Rhum 2014, it’s now time for the second phase of development. Equipped with asymmetric foils (L-foil to port and C-foil to starboard) and new, more substantial T-foil rudders, the 2015 version of the trimaran fitted out by Baron Benjamin de Rothschild is undergoing her first sea trials offshore of Lorient; the first flights in real conditions." The second full Moon of July is just around the corner. According to modern folklore, it is a "Blue Moon." During most years, the Earth experiences 12 full moons, one in each month. But some years, such as 2015, have 13 full moons, and one of those "extra" lunar displays gets the label of Blue Moon. The lunar or synodic month (full moon to full moon) averages 29.530589 days, which is shorter than every calendar month in the year except for February. Those extra one-half or one-and-one-half days accumulate over the year, causing some years to have 13 full moons rather than 12. The phenomenon has more significance for astrologers, people who claim they can glean meaning from the movement of the stars, than for scientific astronomers. A blue moon traditionally marks a time of change and possibility in the astrological world. This is only one type of blue moon, however. Another definition states that blue moons are “seasonal” and therefore only blue if they are the third of four full moons in one season. This would mean that the next seasonal blue moon would actually occur on May 26, 2016. To see what I mean, here is a list of full-moon dates in 2015: Jan. 5, Feb. 3, March 5, April 4, May 4, June 2, July 2, July 31, Aug. 29, Sept. 28, Oct. 27, Nov. 25 and Dec. 25. In 2016, the first full moon falls on Jan. 23, and each calendar month has only one full moon. The blue moon is the first since August 31, 2012, and won’t be seen again until January 31, 2018. In 1946, Sky & Telescope magazine published an article that misinterpreted the older definition, defining a Blue Moon as the second full moon in a calendar month. This has become the most recent and perhaps most widely accepted definition of a Blue Moon. 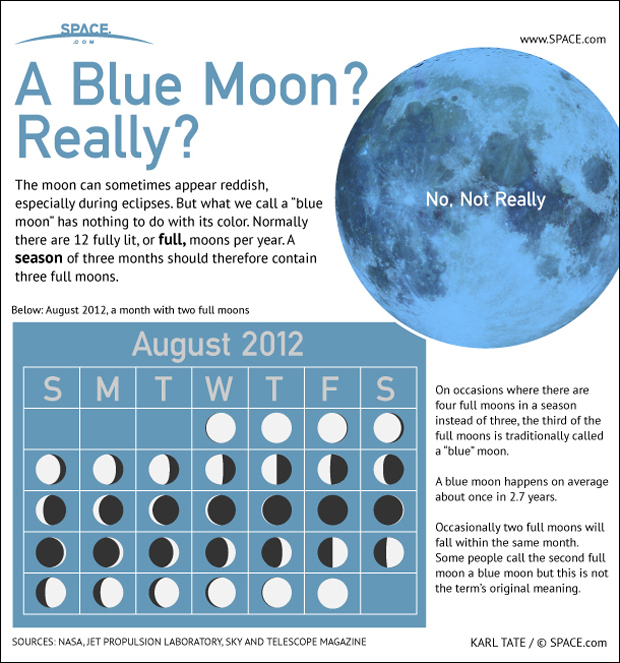 And hence, the full moon on July 31 is referred to as a Blue Moon, because it was preceded by the full moon on July 2. By this definition, a Blue Moon occurs roughly once every 2.7 years. The full moon appears to last for at least the length of one night, but technically speaking, it is an instantaneous event: It occurs when the sun, Earth and moon fall close to a straight line. It takes place at the same instant everywhere in the world, whether the moon is above or below the horizon. So, when you look at the Blue Moon on Friday morning, don't expect to see a different color scheme (although it is possible for the moon to appear to have a bluish hue). Just be aware that the so-called Blue Moon is a byproduct of the contrast between the calendar month and the lunar month. 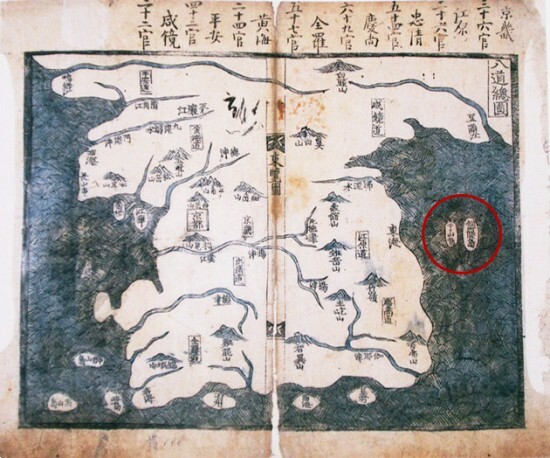 A map issued by the Japanese Army in 1936, left, shows Dokdo drawn within Korean territory. 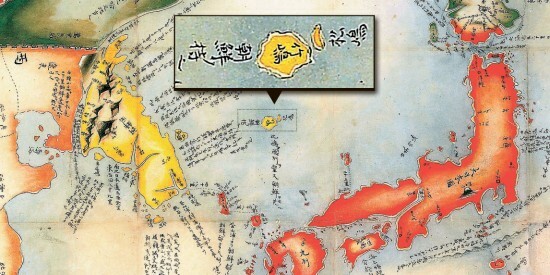 But Japanese scholars have argued that for convenience’s sake, Dokdo was depicted near Korea. A similar map drawn up the next year, right, directly names Joseon, the name of Korea at the time, where Dokdo was categorized. 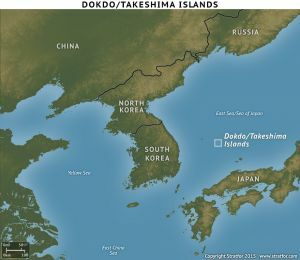 This travelogue from the disputed island of Dokdo, also known as Takeshima, was written by a Stratfor analyst traveling in South Korea. Dokdo is a small island - really a couple of small islands grouped closely together. Sparsely vegetated, these jagged remnants of an extinct volcano support a local fisherman's family and a contingent of South Korean police officers. They also lie at the heart of a historical and geographical controversy between South Korea and Japan. Seoul controls the islets and calls them Dokdo. Tokyo, however, contests that claim and calls them Takeshima. In spite of the controversy, visiting Dokdo was not difficult, just time-consuming. The overnight train from Seoul arrived in Jeongdongjin, on the east coast of South Korea, half an hour before sunrise. In the pre-dawn light it was easy to see the soldiers as they moved in line abreast formation across the beach down to the edge of the sea, undertaking the morning patrol for suspicious activity. Although we were over 100 kilometers (60 miles) south of the Demilitarized Zone, we were just south of the town of Gangneung. It was there that in 1996, a North Korean infiltration submarine became stranded offshore and the crew headed inland, eluding South Korean forces for more than a month. To get to Dokdo, we took the ferry from Gangneung to Ulleungdo, the farthest east of South Korea's larger islands. From Ulleungdo, weather permitting, it is another hour-and-a-half ferry ride to Dokdo. For South Koreans, journeying to the island is the pinnacle of patriotic tourism. Once they disembark, flag-waving visitors remain about 40 minutes on the pier on the easternmost of the two main islets. The eastern islet also has the police guard station and a helipad. The western islet hosts the home of a local fisherman, the only permanent resident. From Ulleungdo to Dokdo is 47 nautical miles, and South Korea considers Dokdo within the jurisdiction of Ulleungdo. Japan considers what it calls "Takeshima" part of the administrative district of the Oki Islands, around 85 nautical miles away. But Japan will also be quick to note that Takeshima is only 114 nautical miles from Honshu, the main island of Japan, closer than the South Korean mainland, which is 117 nautical miles away. Tokyo and Seoul both expend major efforts to explain why they are the rightful owners of the disputed island, and each has its own historical maps and charts, documents and records to wield in debate. At the moment, South Korea undoubtedly controls Dokdo, but Japan is challenging the legality of that occupation. Also up for debate is whether the set of islets really even constitute an island, or simply a collection of rocks. The United States and some other nations, after all, call the islands the "Liancourt Rocks." The difference between an island and a rock may be open to interpretation, but it has important economic and political implications. With ample fishing and expectations of sub-sea oil, gas and mineral reserves, this is far from a frivolous dispute, or one merely reflecting centuries of animosity and staunch nationalism. Maritime agreements, roughly stated, specify that an island must be visible above the surface at high tide and must be habitable or capable of sustaining economic activity. The designation "island" grants the entity 12 nautical miles of territorial sea and a 322-kilometer exclusive economic zone, and it can be used in designations of continental shelves. A rock must also be visible above water at high tide, but it does not need to support human habitation or economic activity. A rock is granted the same 12 nautical miles of territorial sea but not an exclusive economic zone. Dokdo is home to a small population, but most of its water and food supplies (aside from seafood) are imported. South Korea says this proves it is habitable, but others disagree. Although the competition between South Korea and Japan is in this case rather tame, Asia is littered with disputed islands, reefs, submerged rocks and shoals. These tensions are much more significant. Chinese public animosity over Japan's claims on the Senkaku Islands (China calls them Diaoyu) triggered riots, looting and caused some Japanese businesses to leave China. Vietnam and China have already had several military engagements over the Paracel Islands. Chinese construction projects on several reefs and islets in the Spratly chain in the South China Sea upset the Philippines and prompted objections from Washington. And the list continues: most Southeast Asian nations claim overlapping portions of the contiguous seas. International law offers only the most dubious help in resolving these disputes. Geographic designations that are meant to help distinguish between the different types of landmasses are ambiguous. This only compounds the dizzying array of competing claims. On the other side of the Eurasian landmass, Europe is rethinking the legitimacy of borders and even the definition of nations, states and sub-nations. In Asia, land borders may be porous at places, but they are still fairly well-defined. It is at sea that territorial boundaries are really being reassessed. Nationalism plays a role, as does economic security. Nations need to guarantee access to maritime resources and to the vital trade routes throughout the region. Asia wraps around the East and South China seas, around the Bay of Bengal and the Indian Ocean. And when water is the organizing principle of the continent, the question of who owns an island, rock or reef and even of who is allowed to name a body of water takes on national strategic significance. With a large common sea and nations with an economic ability and necessity to act, maritime competition will only grow more intense. The flag-waving Korean tourists on Dokdo may seem far less significant than the controversial 3,000-meter (almost 10,000-foot) Chinese runway on Fiery Cross Reef, but it is no less part of a national strategy to secure economic and strategic interests in a rapidly changing region. 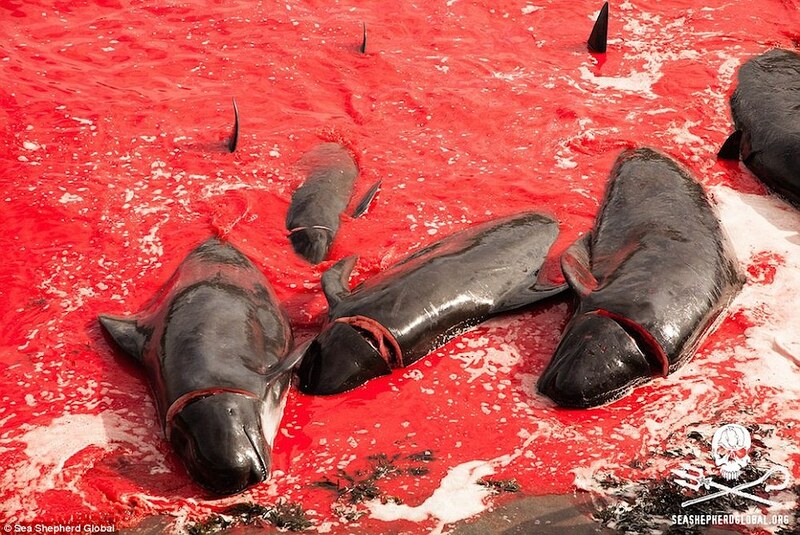 This footage released by Sea Shepherd conservation campaigners shows a mass slaughter of pilot whales in the Faroe islands. Faroese villagers have slaughtered about 250 pilot whales in the past 24 hours according to Sea Shepherd activists monitoring the traditional summer hunts in the north Atlantic islands. 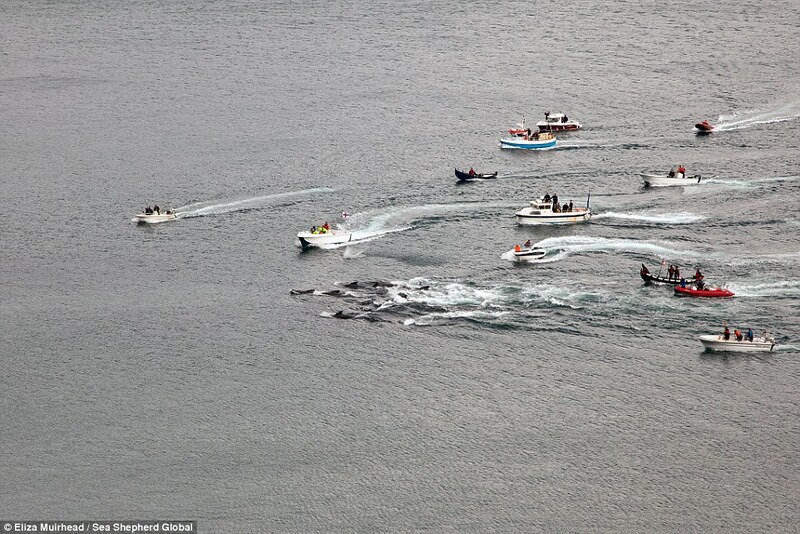 The whale pods, which migrate past the islands in July and August, were herded by flotillas of small boats on to two beaches where villagers waded into the water to kill them with lances. Seven protesters, mainly from European countries, have been arrested this week for allegedly interfering with the the traditional community hunts, known as “grindadráp”. 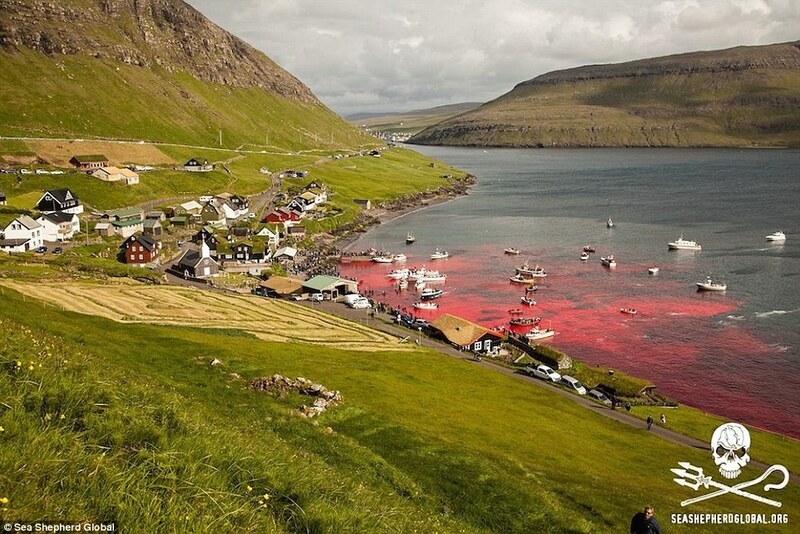 Amsterdam-based direct action group Sea Shepherd, which has 36 people on two boats close to the islands and a further 20 supporters on Faroese islands, claimed on Friday that the Danish navy was helping the Faroese whalers. Although the islands are self-governing, they are financially dependent on Denmark. “It was perfectly clear that the Danish navy ships Triton and Knud Rasmussen were present to guard one grindadráp, and that the slaughter [only] proceeded with the full consent of the Danish navy,” said Wyanda Lublink, captain of the Sea Shepherd boat Brigitte Bardot. “How Denmark – an anti-whaling member nation of the European Union, subject to laws prohibiting the slaughter of cetaceans – can attempt to justify its collaboration in this slaughter is incomprehensible,” he said. Footage from the hunt suggests that 111 pilot whales were killed on a beach at Nólsoy and a further 142 near the capital Tórshavn. 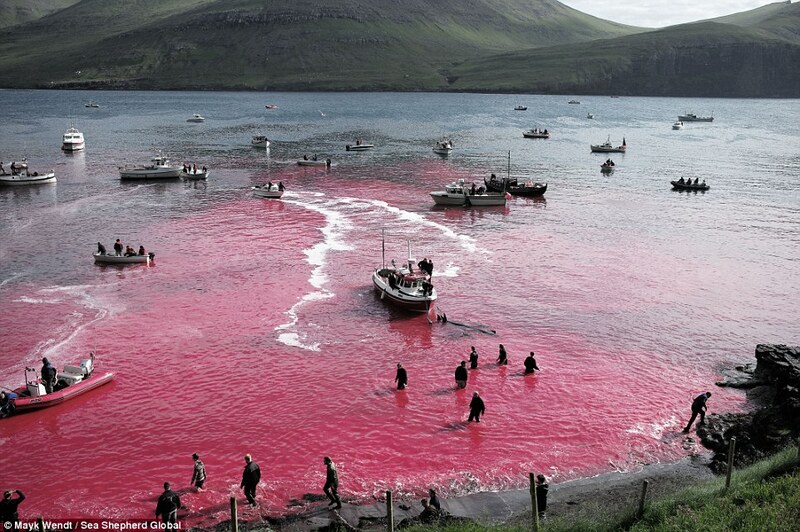 Whaling in the Faroes has been practiced for hundreds of years and is regulated by the Faroese authorities. Around 800 pilot whales and some dolphins are killed annually. Satellites use chlorophyll’s green color to detect biological activity in the oceans. 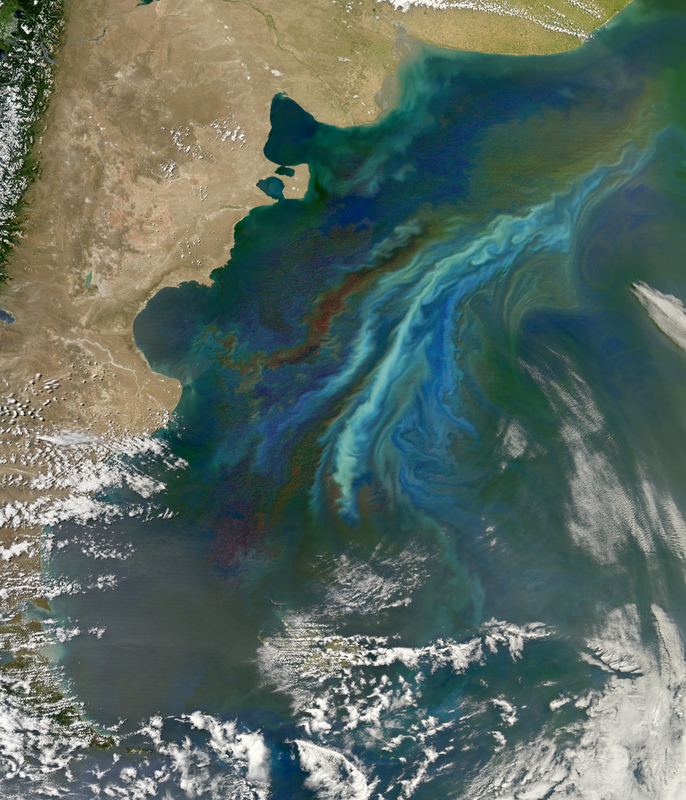 The lighter-green swirls are a massive December 2010 plankton bloom following ocean currents off Patagonia, at the southern tip of South America. New research using NASA satellite data and ocean biology models suggests tiny organisms in vast stretches of the Southern Ocean play a significant role in generating brighter clouds overhead. Brighter clouds reflect more sunlight back into space affecting the amount of solar energy that reaches Earth’s surface, which in turn has implications for global climate. The results were published July 17 in the journal Science Advances. "The clouds over the Southern Ocean reflect significantly more sunlight in the summertime than they would without these huge plankton blooms," said co-lead author Daniel McCoy, a University of Washington doctoral student in atmospheric sciences. "In the summer, we get about double the concentration of cloud droplets as we would if it were a biologically dead ocean." Although remote, the oceans in the study area between 35 and 55 degrees south is an important region for Earth's climate. Results of the study show that averaged over a year, the increased brightness reflects about 4 watts of solar energy per square meter. McCoy and co-author Daniel Grosvenor, now at the University of Leeds, began this research in 2014 looking at NASA satellite data for clouds over the parts of the Southern Ocean that are not covered in sea ice and have year-round satellite data. The space agency launched the first Moderate Resolution Imaging Spectroradiometer (MODIS), instrument onboard the Terra satellite in 1999 to measure the cloud droplet size for all Earth's skies. A second MODIS instrument was launched onboard the Aqua satellite in 2002. Marine stratocumulus clouds stretched across the southern Indian Ocean in this image taken by NASA's Aqua satellite in early March 2013. Clouds reflect sunlight based on both the amount of liquid suspended in the cloud and the size of the drops, which range from tiny mist spanning less than a hundredth of an inch (0.1 millimeters) to large drops about half an inch (10 millimeters) across. Each droplet begins by growing on an aerosol particle, and the same amount of liquid spread across more droplets will reflect more sunlight. Using the NASA satellite data, the team showed in 2014 that Southern Ocean clouds are composed of smaller droplets in the summertime. But that doesn't make sense, since the stormy seas calm down in summer and generate less sea spray to create airborne salts. 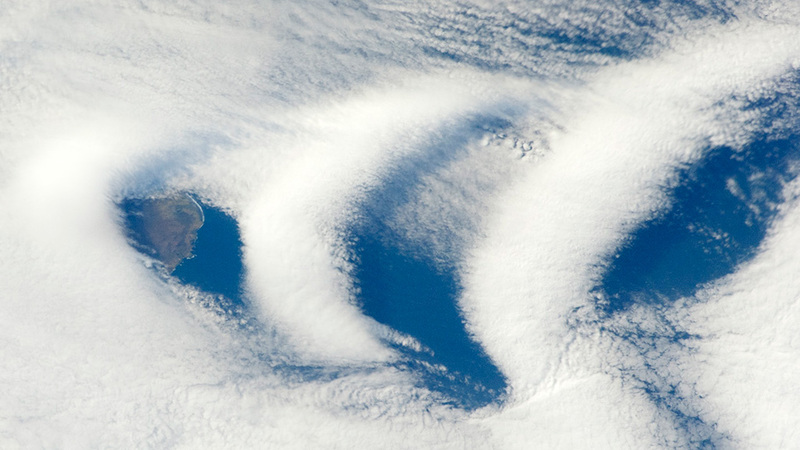 Wave clouds form over Île aux Cochons in the Southern Ocean. The new study looked more closely at what else might be making the clouds more reflective. Co-lead author Susannah Burrows, a scientist at the Pacific Northwest National Lab in Richland, Washington, used an ocean biology model to see whether biological matter could be responsible. 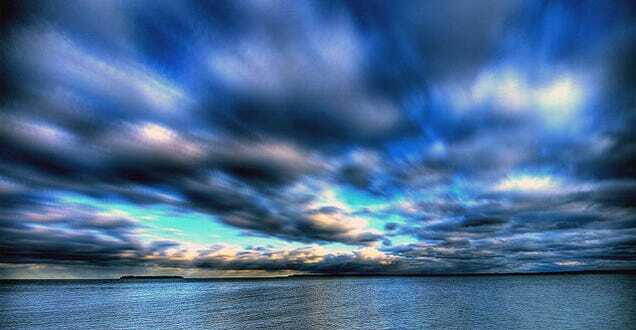 Marine life can affect clouds in two ways. The first is by emitting a gas, such as dimethyl sulfide released by Sulfitobacter bacteria and phytoplankton such as coccolithophores, which creates the distinctive sulfurous smell of the sea and also produces particles to seed marine cloud droplets. The exact boundaries of the Southern Ocean are as up in the air as its many clouds. "The dimethyl sulfide produced by the phytoplankton gets transported up into higher levels of the atmosphere and then gets chemically transformed and produces aerosols further downwind, and that tends to happen more in the northern part of the domain we studied," Burrows said. "In the southern part of the domain there is more effect from the organics, because that's where the big phytoplankton blooms happen." The Southern Ocean is a unique environment for studying clouds. Unlike in other places, the effects of marine life there are not swamped out by aerosols from forests or pollution. The authors say it is likely that similar processes could occur in the Northern Hemisphere, but they would be harder to measure and may have a smaller effect since aerosol particles from other sources are so plentiful. (Chart 16081: Alaska-Arctic Coast, Scott Pt. to Tangent Pt. ). The massive thumb-shaped shoal at the top left was identified by NOAA using Landsat satellite data. On the most recent nautical chart of the Beaufort Sea where the long narrow Tapkaluk Islands of Alaska’s North Slope separate the sea from the shallow Elson Lagoon (Nautical Chart 16081) a massive shoal is immediately noticeable just west of the entrance to the lagoon. On the chart it looks like a massive blue thumb jutting out into the sea. The National Oceanographic and Atmospheric Administration (NOAA) identified this prodigious, 6-nautical mile-long, 2-nm-wide shoal using Landsat satellite data. It was sometime around 1950 that a hydrographic survey ship last plied these waters taking water depth measurements along its path using a single-beam echo sounder and visual navigation. These data points were laboriously merged with shoreline and hazard information to create this chart, Alaska-Arctic Coast, Scott Pt. to Tangent Pt. Given the low ship traffic in the region, updating this chart was lower priority than other high-traffic areas. But things change—fishing and water-commuting traffic have risen in the area, as has marine tourism; but that’s not all: bottom depths have changed too as currents, erosion, and sediments have worked together to sculpt the seafloor. In NOAA’s Office of Coast Survey, the Marine Chart Division is responsible for updating the suite of over 1000 nautical charts that keep mariners in U.S. waters safe. Their mandate covers all U.S. territorial waters in the U.S. Exclusive Economic Zone (EEZ), a combined area of 3.4 square nautical miles that extends 200 nautical miles offshore from the nation’s coastline. The U.S. has the largest EEZ of all nations in the world, but it ranks behind 18 other nations in the number of vessels with hydrographic surveying capabilities. Their job is sizable and expensive. While the Army Corps of Engineers is responsible for maintaining shipping channel depths, providing bathymetry everywhere else in U.S. waters is NOAA’s duty. The responsibilities of NOAA’s Marine Chart Division are immense. 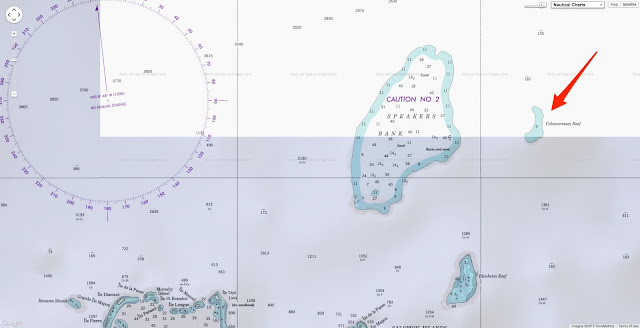 Charged with providing accurate charts for mariners, NOAA cartographers need to know when existing charts are out-of-date. To determine if charts are current, they employ lots of tools. They monitor navigation hazard reports submitted by mariners; they watch ship traffic patterns using vessel positioning information (via the Automatic Identification System); and more-and-more they are turning to satellite information, especially Landsat data. The concept of SDB is that different wavelengths of light penetrate water to differing degrees. The smaller the wavelengths (e.g. blue and green light) penetrate water more than longer-wavelengths (e.g. near infrared, shortwave infrared). When water is clear and the seafloor bottom is bright (sandy for example) estimates of depth can be made by modeling the depth of light penetration based on the amount of reflectance measured by the satellite. And when multiple visible-wavelength spectral bands are used together, the effects of seafloor reflectance variability and water turbidity are lessened. These modeled depth measurements typically do not meet hydrographic accuracy standards, so in the past SDB measurements were eschewed. The Joint Hydrographic Center, a think-tank of researchers investigating technology and mapping challenges in NOAA’s Office of Coast Survey, realized that Landsat SDB could be an important reconnaissance tool. A single Landsat image is about 100 nautical miles across and affords a wide overview of a coastal area. 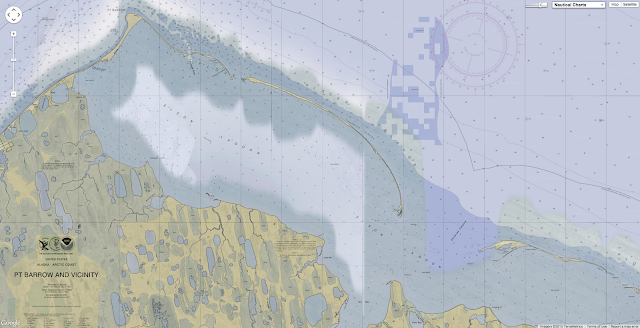 Maps of SDB can be compared with existing nautical charts. Places where depth patterns do not match are more closely examined. Has the seafloor changed in this area? 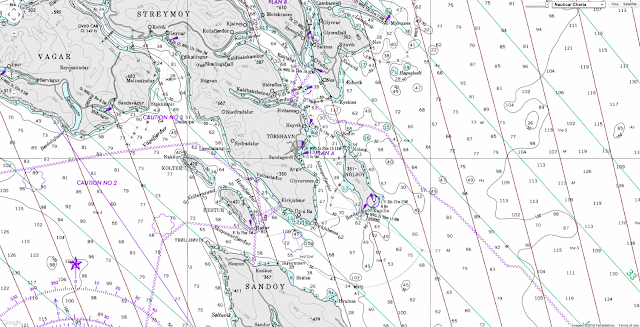 If an area looks shallower than what is presented in the chart and if there is a reasonable amount of vessel traffic or corroborating mariners’ reports in the area, the chart location is tagged as a higher-priority candidate for hydrographic mapping—i.e. sending out a hydrographic ship to make depth measurements using sonar (multi-beam or single-beam). Klemm has been out on hydrographic voyages, and knows well the amount of time and effort that goes into gathering bathymetry information. He is excited about the prospect of formally incorporating Landsat SDB into his workflow. “SDB products to evaluate the current state of existing bathymetry representation is pretty amazing because of the temporal resolution of the satellite data—a little over every two weeks and you get a new shot of an area,” Klemm describes. Landsat 8’s orbit puts it back over a given location every sixteen days. Pe’eri and Klemm have been working on a NOAA policy about the use of SDB. They are outlining how to use SDB to prioritize hydrographic surveys using a chart adequacy assessment procedure they have developed. They are also working on a policy of how to update a chart with features found using satellite imagery. Landsat is good at identifying new shoals, like that big 12 nm thumb-shaped shoal off of Alaska’s North Slope. And NOAA thinking is that it is better to amend charts to tell mariners that satellites indicated a shoal, even though exact depths cannot be provided until the next hydrographic survey. Uncharted shoals have sunk many ships. In the late 1960s, research groups began to experiment with remote bathymetry using multispectral airborne data in an effort to make measurements over large tracts of coastal waters in search of navigational hazards and shifting bathymetry. With the launch of Landsat 1 in 1972, these newly developed methods could be used with data collected by the satellite’s Multispectral Scanner System and its wide 100 nm-wide images—satellite derived bathymetry was born. In 1975, NASA teamed with famed oceanographer Jacques Cousteau to conduct an ocean bathymetry experiment using Landsat data to measure water depth in the Bahamas and off of Florida’s eastern coast. Cousteau’s ship, the Calypso, anchored over a study site as Landsats 1 and 2 collected data from overhead, while they simultaneously took depth measurements using the ship’s sonic depth finder. In this pre-GPS timeframe, LORAN-C radio measurements were used for locating the boat position. They also dove to the seafloor to take in situ reflectance measurements with a submarine photometer. This early experiment proved the feasibility of mapping shoals in clear water to depths equal to or greater than those needed for safe shipping. A year later, a Landsat 2 image acquired on March 29, 1976 revealed a major uncharted 8-km long reef in the Indian Ocean’s Chagos Archipelago: “There was a major reef or bank where the chart showed safe, deep water and some banks appeared to be out of position by more than 15 km relative to the nearest land,” wrote James Hammack, a participant in the NASA/Cousteau experiment and a cartographer with the Defense Mapping Agency’s Hydrographic Center (now part of the National Geospatial-Intelligence Agency). 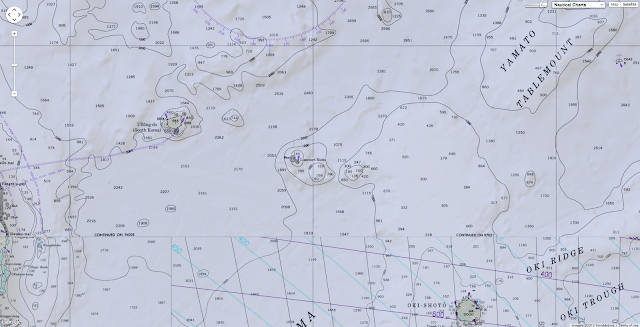 Within a few months, the newly found reef, named Colvocoresses Reef after the USGS cartographer who identified the feature on the Landsat image, was added to DMA nautical chart 61610. In the interim, Notice to Mariners were sent out to warn sailors in the region. Based on the success of the NASA/Cousteau and Chagos Archipelago experiments, DMA requested that Landsat data be collected globally over coastal areas. 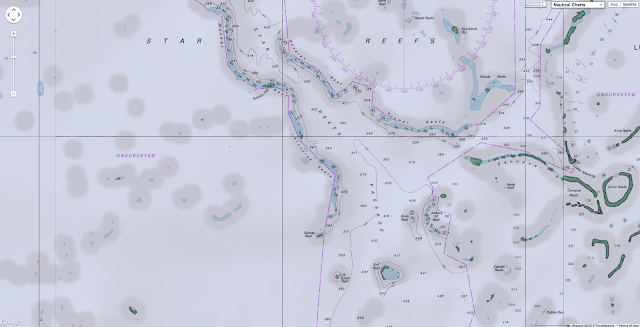 This data was used to “augment the completeness” of it nautical chart products. DMA also used Landsat data to visually verify ship-reported navigational hazards. Some other documented cases of Landsat data providing critical information to navigation include a safe deep passage through Papua New Guinea’s Star Reefs, which was first discovered using Landsat imagery. The Australian Royal Navy ship Flinders confirmed this passageway, which enabled ships to more quickly travel from Australian ports to East Asian ones. Likewise, British Admiralty Chart 322 of the Red Sea near Al Qunfidha had to be completely revised after it was compared with Landsat data. The International Hydrographic Organization and the United Nations’ Intergovernmental Oceanographic Commission jointly create an authoritative, publicly available, global bathymetry map known as the General Bathymetric Chart of the Oceans, or GEBCO. GEBCO charts have been published since 1903. Despite this heritage, only about a tenth of the ocean floor has been mapped. 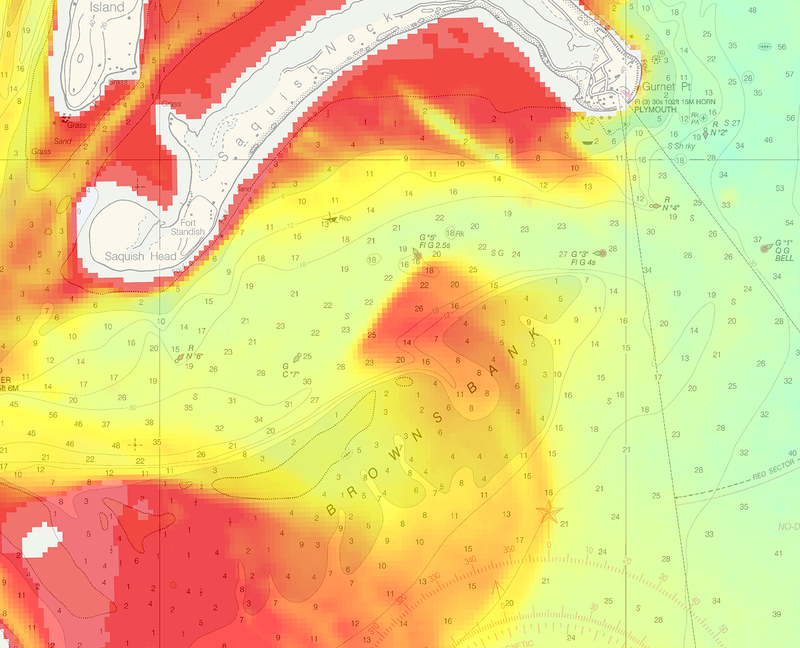 Satellite Derived Bathymetry measurements overlaid on a chart of Plymouth Bay in Massachusetts. The red indicates shallow waters. Here, the SDB indicates that the the shoaling of Brown’s Bank has shifted since the chart’s creation. GEBCO is no stranger to SDB. They have been aware of its capabilities for decades. But now that Landsat data are publically and freely available it is getting more and more use—as no doubt the European Space Agency’s Sentinel-2A, with spectral bands similar to Landsat 8, will as well. The GEBCO companion how-to guide for creating bathymetric charts, called The GEBCO Cookbook, includes a chapter on using Landsat to derive bathymetry. 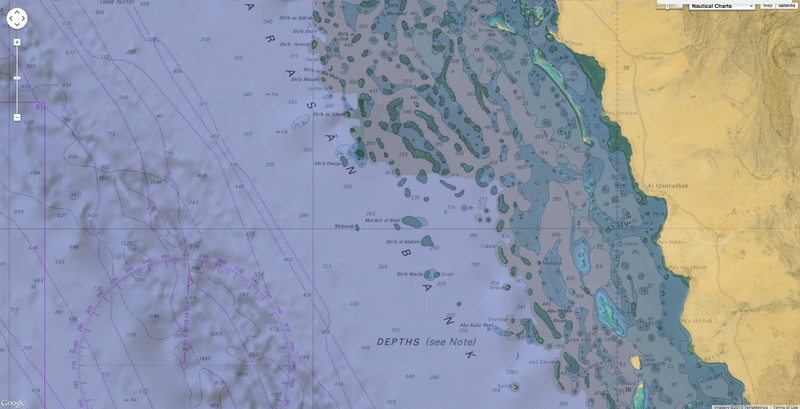 For cash-strapped national hydrographic offices, using free Landsat data to assess the adequacy of existing charts is essential, allowing them to allocate scarce resources with maximum impact to mariner safety. SDB alone does not meet IHO accuracy standards, but its use as a complimentary prioritization and planning tool is key. NOAA, as a major Landsat user, has been sponsoring international GEBCO students from around the world (Kenya, Sri Lanka, Ecuador, Philippines, etc.) and teaching them how to use SDB to update charts in their home offices. This summer from July 14–16, NOAA hosted a workshop to share this knowledge in the confidences that using SDB will make mariners worldwide more safe. Hydrographers from 11 countries attended. The workshop was a big success and more workshops are planned for 2016. Water clarity has been a limiting factor when it comes to SDB. If waters are too turbid (full of sediments that obscure light reflectance from the seafloor), then bathymetric measurements cannot be made. The inability of longer wavelengths, such as shortwave infrared light, to deeply penetrate water allows hydrographers to map shoreline change. But when concentrations of suspended sediments are great enough to thwart penetration by shorter wavelengths, SDB by definition suffers. But in NOAA’s Marine Chart Division, researchers are thinking outside of the SDB-box. Pe’eri, in a collaborative study with NOAA and the U.S. Coast Guard, has pioneered turbidity mapping as a proxy for bathymetric measurements. In enclosed waterbodies with strong currents, such as bays and sounds, turbid channels show up on Landsat imagery—and these turbid channels illuminate where currents are carving deeper channels that are safe for boat passage. 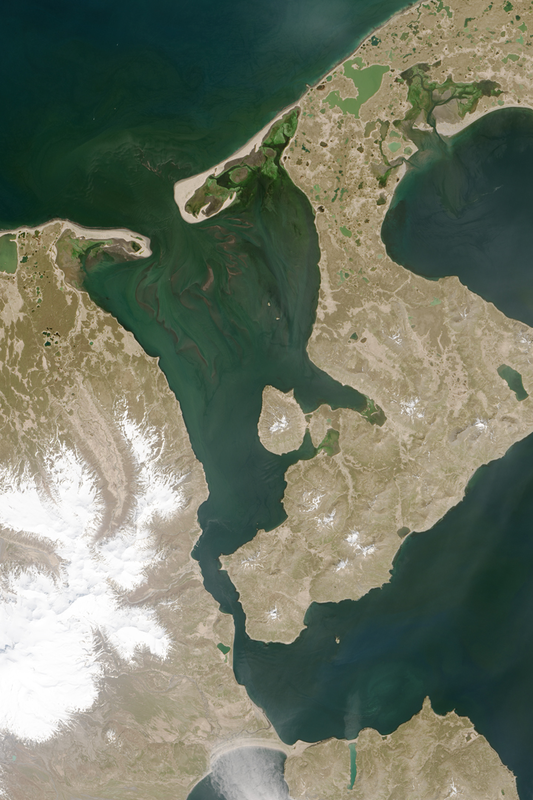 Landsat 8 image of In Bechevin Bay, the easternmost passageway between the Gulf of Alaska and the Bering Sea. This natural color, pan-sharpened image was acquired on May 14, 2014. Back in the arctic, where near-shore changes occur rapidly because of seasonal sedimentation and erosion, new SDB techniques like turbidity mapping are preventing maritime mishaps. 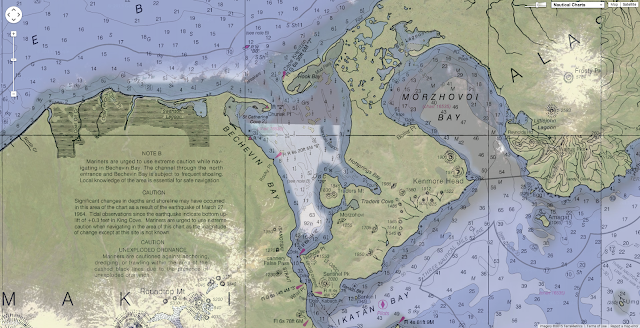 In Bechevin Bay, where the easternmost passageway between the Gulf of Alaska and the Bering Sea provides fisherman with a shortcut for three ice-free months a year, the location of sand bars can shift significantly because of melting ice in this narrow passage. With the help of Landsat SDB turbidity maps, the new locations of these sandbars can be estimated. Recently this has led to the discovery of a new, straighter, and more geologically stable channel. “SDB estimated from Landsat turbidity maps can help guide NOAA charting craft when they are mapping the channel each year and placing channel marking buoys. This saves time and it makes the process safer,” Pe’eri says. Pe’eri’s team has also developed a multi-image method to help separate clear and turbid waters using Landsat data. Techniques such as turbidity mapping will grow increasingly important for navigation planning as warming waters enable more industrial development of the Arctic and set the stage for international shipping routes. “Landsat 8 is overwhelmingly better,” Pe’eri says citing the new satellite’s additional cirrus band which helps him better account for atmospheric noise that can counter accurate SDB and Landsat 8’s better radiometric resolution (which means more signal, less noise, and more measurement fidelity). But it’s not just SDB that this innovative office is utilizing. They are also watching traffic patterns using the Automatic Identification System (AIS) and even light communication from recreational boaters, fishermen, tugboats, and larger vessels, and together with bathymetry measurements are prioritizing which charts are in perilous need of revision. The Triton 3300/3 is one of the most popular submersible and it can take a pilot and two passengers. Tucked away in an industrial park in Vero Beach, Florida, 34-year-old engineer John Ramsay is painstakingly drafting a design for a submarine that will be able to reach the five deepest points in the ocean. It's a personal vessel for a billionaire. “It’s going to be a world- or certainly industry-changing vehicle,” Ramsay said. The $25m, two-man submarine will take six months to design and another two years to build by Triton Submarines. His client is one of several who see the ocean depths as a new playground. A new breed of billionaires is tapping into their inner Jacques Cousteau — the famous undersea explorer — and they're willing to pay big. With pricetags starting at a $3m, and requiring a yacht to park on, these personal submarines are not only for adventure, but also for their owners to help advance research and exploration in ways that weren’t dreamed about a decade ago. “Part of this trend is that it is cool to have a submarine and part of it is that a private person can support research with it,” said Charles Kohnen, owner of submarine builder SEAmagine Hydrospace Corp in California. Still nascent, the personal submarine industry comprises four companies that account for just 20 to 30 privately owned and manned subs across the globe, according to Kohnen, an early pioneer who sold his first sub in 2000. These sub owners frequently offer charters, at a price often up to $30,000 a day. Some of these vessels have been rented out by other billionaires looking for a new holiday adventure, while others have been lent to research groups to discover new sea life or explore shipwrecks. Few research organizations can, after all, afford to buy a submarine, let alone pay for upkeep and maintenance or cover the cost of the expensive ship that's required to transport it out to sea. So, teaming up with a private owner has proven to be one promising strategy. In 2013, researchers traveling in a privately owned submarine off the coast of Japan filmed a giant squid in its natural habitat for the first time. And, in March of this year, a team using submarines owned by Microsoft co-founder Paul Allen found the Japanese battleship Musashi, which had been sunk off the coast of the Philippines in World War II. Sometimes, however, the thrill of discovery lies purely with the submarine owner. In 2012, filmmaker James Cameron broke a record for the deepest solo dive when he used a sub he owned to explore the Mariana Trench, the deepest spot in the oceans, located in the western Pacific. Cameron’s vehicle wasn’t designed for multiple trips into the extreme pressure of deep water and was retired after its only trip. The diving took place at Cocos Island in Costa Rica in conjunction with Misión Tiburón an organization that promotes the conservation of sharks and other marine species. The video shows the abundance of sea life at Cocos’ marine sanctuary from the shallow depths to the very deep unexplored regions where a rare Prickly Shark was found during this expedition at a depth of 340m (1115 ft). Most private subs reach depths of 1,000m or less. The biggest construction challenge remains the compartment that holds passengers, which become compromised when under pressure at depth. Triton’s subs include a 6.5-inch-thick acrylic passenger bubble made in Germany at a cost of about $1m. To go deeper, the sub must be far more durable, including a sphere of ultra-thick glass that could cost four or five times as much, Ramsay said. Just how effective these private owners can be at research or exploration is unclear, said George Bass, professor emeritus at the Texas A&M University Nautical Archaeology Program. Bass is one of the world’s most prolific hunters of shipwrecks, especially in the Mediterranean. Using a SEAmagine submarine off the coast of Turkey, he once found 14 wrecks in a month. But Bass doubts that private owners could have the same kind of luck. “It’s possible [that private sub owners] could stumble on a shipwreck or a new discovery,” Bass said. In Costa Rica, a submarine named DeepSee is being used by adventure travellers, researchers, and scientists for dives predominantly around Cocos Island, about 350 miles off the mainland. With its unique cross currents, the water surrounding the islands is rich with rare coral and marine life, from crustaceans to whale sharks. DeepSee’s owner, an eponymous private company, allows researchers from the University of Costa Rica to take the sub down for free, said operations manager Shmulik Blum, and they sometimes find new sea life never seen before. Two years ago, the Costa Rican researchers discovered an entire new family of coral, the kind of discovery that hadn’t been made in 40 years, Blum said. The new, soft coral is in waters so deep that it never sees light and lacks any pigment. Using DeepSee’s robotic arm, researchers scooped up a sample that they later analysed in the lab. “Usually, the lack of access to waters this deep limits the ability to learn about it,” Blum said. Blum was speaking by phone from DeepSee’s office in the small port of Puntarenas. Hours later, he and his submersible team would be making the day and a half journey to the Cocos Island for a new set of dives. “Maybe we’ll find something new this time too,” he said. Dreams, freedom, passion. But also fear and boundaries to break. This is the essence of surfing.